"A nice light seafood dish, always a crowd pleaser." Heat olive oil and 3 tablespoons butter in a large skillet over medium-high heat; cook and stir asparagus until tender and browned, about 10 minutes. Stir mushrooms into the skillet and cook and stir until they have given off their liquid, about 5 more minutes. Stir in tomatoes and cook until softened, 2 to 3 minutes; mix in juice of 1 lemon. Set the vegetables aside. 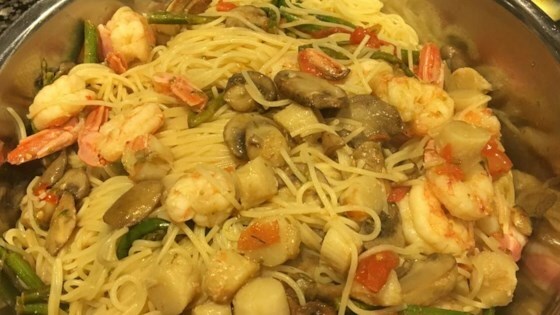 Melt 1/2 cup butter in a separate large skillet over medium heat and cook and stir shrimp and scallops in butter until shrimp are bright pink and the seafood is slightly opaque, 3 to 5 minutes. Mix juice of 1 lemon into seafood, turn heat to low, and continue to cook seafood until fully opaque, 3 more minutes. Drain excess liquid if necessary, leaving 2 tablespoons of liquid in skillet. Bring a large pot of water to a boil and stir in 2 tablespoons butter, salt, and juice of half a lemon. Stir angel hair pasta into the boiling water and cook until pasta is tender but still slightly firm, about 5 minutes. Stir occasionally during cooking; drain well and transfer to a large bowl. Drain liquid from asparagus mixture if needed, and stir vegetables into the pasta. Lightly toss vegetables and angel hair pasta with 1 package of Italian cheese blend; mix in the cooked shrimp and scallops. Mix remaining package of Italian cheese blend into pasta mixture and allow to stand until cheese melts, about 3 minutes; toss again and serve. this was much to dry for our tastes.